Mentoring provides the 'bridge' that enables people to use their skills, background and commitment to reach youth and communities most in need. This guide to mentoring youth is designed for mentors in the ConnectEd mentoring program-but can used by various mentoring programs. This guide is organized in three parts. Part one, Becoming a Mentor, will help mentors learn what is involved in being a mentor, prepare them to meet with mentees, and give ideas on what to expect and how to build, sustain and (when it is time) to end a mentoring relationship. 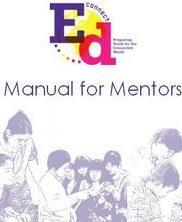 Part two, Getting Started, will help mentors prepare for their first few encounters with mentees. Part three, Activities for You and your Mentee, is a collection of activities that mentors and mentees can complete at times that the mentor thinks are most appropriate. This guide was developed for the ConnectEd Project, funded by Alcatel-Lucent. The project works to address the factors limiting the work and life options for disadvantaged youth around the globe.